The number of fox-related calls received by council pest controllers has increased in the recent years. 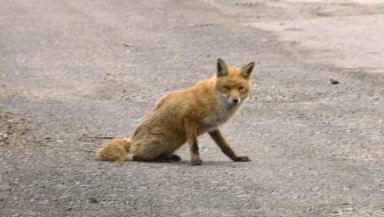 Pest controllers in Dundee are being called out to deal with an increasing number of urban fox problems in the city. Dundee City Council pest controllers are dealing with at least one call-out a week as the animals become bolder in their hunt for food. Concerns have been raised about the mammals being a possible threat to domestic pets, and even children, but council officials say that when treated with common sense, foxes should not pose a problem. Recently a fox tried to get into Ed Thomson’s Broughty Ferry home as it was attracted by cat food left out for his pet. He told STV News: “At 2am there was an absolutely unholy row from the kitchen area, really bad, like two cats fighting. “I ran through and the cat looked rather startled and the cat flap just gave a little noise. I phoned the council and they were very good. “The lad came down and had a look around and said there was definite evidence that foxes had been about and there were a lot in the area." A few years ago council pest controllers were dealing with one fox-related incident a month in Dundee, but now they are responding to at least one call-out a week. Councillor Jimmy Black said: "We can shoot them, and occasionally we do, but it's pretty dangerous in an urban setting and we'd rather not do it. “There are other things we can do, we can trap them but in the end what we would really rather do if we can possibly manage it is leave them alone. “They are not really doing very much harm and as long as people are sensible about their bins, about their foods, not providing a habitat in their gardens for them to live, then eventually the numbers will peak and they won't really be a problem. “We can live happily along with foxes and actually sometimes they do a lot of good. Foxes eat rats - would you rather have a rat in your garden or a fox - I know what I would prefer."